We know you love your naturally curly hair, but how do you show it that you care? By giving it the special moisturizing attention it needs to stay healthy and grow strong. The most nourishing treatments for your natural curls are gentle natural products without harsh, drying or potentially irritating ingredients. 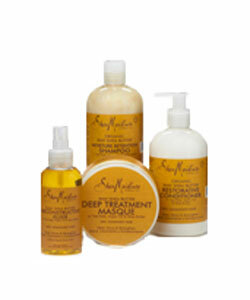 SheaMoisture, a family brand, understands what a curl wants and what a curl needs! SheaMoisture makes it easy to care for your natural hair with four lines of products for different hair textures and needs, full of naturally nourishing ingredients. They left out all of the bad stuff but added in lots of good stuff to provide the best solutions to your hair care needs. Sulfates: The most commonly used harsh sulfates found in most shampoos include sodium lauryl sulfate (SLS), sodium laureth sulfate (SLES) and ammonium lauryl sulfate (ALS). They can irritate the scalp and strip hair of much needed natural oils, leaving you with dry, frizzy curls. Phthalates: The main phthalates used in cosmetic products are dibutylphthalate (DBP), dimethylphthalate (DMP) and diethylphthalate (DEP). They might also be listed as "butyl ester" or "plasticizer." Studies reveal phthalates as reproductive and developmental toxins. Why take such a high health risk for cheap, dangerous products? Paraffins: These are usually listed as "liquid paraffin." Paraffins are petroleum distillates, which means that they are derived from petroleum or crude oil. Did you know that the European Union restricts or prohibits these and other petroleum distillates as possible human carcinogens? Gluten: If you have any wheat or other grain allergies, you need to stay away from products containing gluten, a protein found in grains such as wheat, barley, rye and triticale to avoid having skin irritations or reactions. Propylene Glycol: Propylene glycol is a clear liquid used in antifreeze and cosmetic products. Frequent skin exposure to propylene glycol can irritate the skin. Mineral Oil: Mineral oil is another byproduct of the refinement process of crude oil into its refined forms such as gasoline. It is used in hair products as a moisturizer, but it's actually a lubricant that sits on top of the hair. There is strong evidence that mineral oil is toxic to the human immune and respiratory systems, and is a possible carcinogen. With the exception of a few specific ingredients, the FDA (Food and Drug Administration) does not approve cosmetic ingredients. Cosmetic companies are responsible for substantiating the safety of their products and ingredients. As a result, the cosmetics industry is the least regulated industry under the jurisdiction of the FDA. While we all want safe ingredients in our products, the standard for what’s safe isn’t always agreed upon, which is why you should be knowledgeable about what’s in your hair products and determine for yourself what ingredients you are comfortable with. Some ingredients may be safe but can irritate people with sensitivities and generally don’t work well over time. Your best defense is to read every ingredient label! 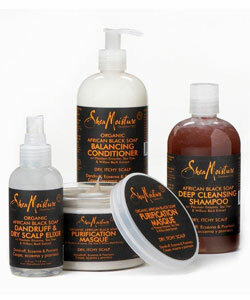 The Yucca & Baobab Collection from SheaMoisture is infused with three highly beneficial ingredients. The collection includes Thickening Shampoo, Volumizing Conditioner and Thickening Moisture Mist. If you have thin or fine hair, you can start by cleansing your curls with the Thickening Shampoo that softens, strengthens and thickens hair, while preventing breakage. If you have naturally coily hair, you know it can be very fragile. Use the Volumizing Conditioner to detangle, strengthen and condition hair while pumping volume. You’ll love the fullness and added volume. Continue to reinforce the thickening and strengthening process by moisturizing with the Thickening Moisture Mist. Baobab Oil: Our hair and scalp needs to be nourished just like the rest of our body and needs a daily dose of vitamins and nutrients. Baobab oil is pressed from the mineral rich seeds of the baobab fruit, which contains vitamins A, C, D, E and F to fortify and strengthen your hair. Yucca: Are you struggling with thinning hair or hair loss? Yucca can help prevent hair loss and aids in thickening hair. Biotin: Biotin is a B-vitamin that can help to strengthen the hair follicle. It is often linked with faster, thicker, healthy hair growth because healthy, growing hair requires biotin. The African Black Soap Collection from SheaMoisture strategically includes these three ingredients in their Deep Cleansing Shampoo, Balancing Conditioner and Dandruff & Dry Scalp Elixir. Use the Deep Cleansing Shampoo to sooth your scalp while helping to regulate the production of the natural oils in your hair and scalp. It removes unwanted buildup, while relieving dry, itchy, flaky scalp creating a fresh start. The Balancing Conditioner also soothes dry itchy scalp. It conditions and moisturizes your hair, while restoring your hair's natural pH balance. Lastly, soothe your scalp and relieve the itching and flaking with Dandruff and Dry Scalp Elixir. PABA: PABA is an abbreviation for para-aminobenzoic acid. It's use as an active ingredient in sun-screens has been discontinued due to the allergic reactions it tends to cause when applied to the skin. International research also indicates that it is a potential carcinogen. Synthetic Color: The most common synthetic colors used in cosmetics are derived from coal tar, which is another by-product of petroleum. Some coal tar dyes are known to cause cancer and so are strictly regulated by the FDA. Other synthetic colors like chromium oxide and aluminum powder can be irritating. Chromium oxide is specifically described as a “cancer hazard” in its Material Safety Data Sheet. Plantain Enzyme: You may have eaten this banana-like fruit before, but did you know that plantain enzyme provides a great natural way to alleviate scalp itchiness and irritation? Tea Tree: Tea Tree oil is a natural antiseptic and can be used as a treatment for scalp infections and problems like dandruff. In hair products it removes buildup while enhancing volume and shine. Willow Bark Extract: Does your dry scalp cause you discomfort? Willow Bark soothes the scalp as it gently exfoliates while removing flakes. The Coconut & Hibiscus Collection from SheaMoisture is the go-to assortment for thick and curly, frizz-free and shiny hair utilizing all three natural ingredients. Get curl definition while trading in brittle curls for bouncy, healthy looking curls. Got coils or wish you did? This is the collection that helps add definition, complete with the Curl & Shine Shampoo to cleanse and start defining your curls; the Curl & Style Milk to detangle and condition hair; the Hold & Shine Moisture Mist for glossy shiny curls and the Curl Enhancing Smoothie to hydrate and define for soft, vibrant, bouncy curls. DEA: DEA, or diethanolamine, among other things is used to provide a heavy lather in shampoos. It can react with other ingredients in products to form a highly potent cancer causing chemical. Parabens: Parabens are used as preservatives in cosmetic products. They have arguably been linked with breast cancer because parabens can act similarly to estrogen and the activity of estrogen in the body has been associated with certain types of breast cancer. Synthetic Fragrance: Unfortunately, when "fragrance" is listed in the ingredients of a product, it is considered a trade secret, meaning that the make up of that fragrance can remain undisclosed. There could legally be any of the above or other harmful chemicals included in what is simply listed as "fragrance" in a hair product. Coconut Oil: Coconut oil provides a host of wonderful natural benefits for the hair and scalp. The antimicrobial action of lauric and caprice acid in coconut oil help to prevent hair loss. It also contains Vitamin E, which keeps the scalp conditioned, healthy and renewed. Coconut oil helps to restore moisture to dry hair because of its capacity to retain hydration keeping hair soft and moistened. Silk Protein: Silk Protein strengthens hair making it smooth and silky to the touch without weighing it down. Neem Oil: Neem Oil adds strength, fullness and overall vibrance to hair. The Raw Shea & Argan Oil Collection from SheaMoisture combines these three natural treasures in a collection that aids in healing, strengthening and growing dry, damaged hair. You can gently cleanse your curls with the award-winning, Moisture Retention Shampoo. If you want to encourage healthy natural waves, moisturize and repair damaged, over-processed hair with the Restorative Conditioner. Add shine, while repairing dull, lifeless strands with the Reconstructive Elixir. For ultra-moisturization, pamper your hair to a weekly treatment with the Deep Treatment Masque. Sea Kelp: Trace minerals in sea kelp help to detoxify hair and scalp of impurities and build-up. Argan Oil: For incredible shine and frizz control, Argan oil is the answer. It also helps rebuild the elasticity of hair, fending off breakage resulting from dry, brittle curls. Shea Butter: Shea butter is rich in essential fatty acids making it effective in shielding and restoring the hair and scalp from damage. It keeps hair hydrated by sealing in much needed moisture. With four collections full of all-natural goodness SheaMoisture makes it easy to find the right nourishing products to suit your curls, coils or waves!